Recent botanical evidence indicates that Coffea arabica originated on the plateaus of central Ethiopia and some how must have been brought to Yemen where it was cultivated since the 6th century. Upon introduction of the first coffee houses in Cairo and Mecca, coffee became a passion rather than just a stimulant. 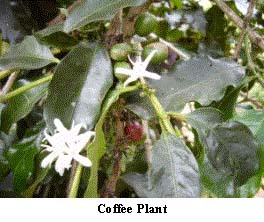 The coffee plant is a woody perennial evergreen that belongs to the Rubiaceae family. Two main species are cultivated today. 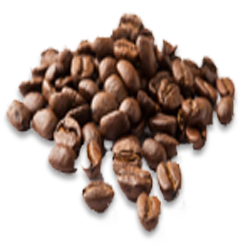 Coffea arabica known as Arabica coffee accounts for 75-80% of the world's production. Coffea canephora, known as Robusta coffee, is more resilient plant than the Arabica shrubs, but produces an inferior tasting beverage. Three to four years after the coffee is planted, sweetly smelling flowers grow in clusters in the axils of the leaves. Fruit is produced only in the new tissue. The Arabica species is self-pollinating, whereas the Robusta species depends on cross pollination. About 6-8 weeks after the flowers are fertilized, cell division occurs and the fruit remains as a pinhead for a period that is dependent upon the climate. The ovaries will then develop into drupes in a rapid growth period that takes about 15 weeks after flowering. During this time, the integument takes the shape of the final bean. The mesocarp will expand to form the sweet pulp that surrounds the bean. The cherry will change color from green to red about 30-35 weeks after flowering. The root system has an absorbing surface that ranges from 400 to 500 m2. There are the main vertical tap root, and lateral roots which grow parallel to the ground. The tap root extends no further than 30-45 cm below the soil surface. Four to eight axial roots may be encountered which often originate horizontally but point downward. The lateral roots can extend 2 m from the trunk. About 80-90% of the feeder root is in the first 20 cm of soil and is 60-90 cm away from the trunk of the tree.